This spring/summer has been an unusual one for our desert garden especially our front landscape. We have a good number of agaves in our front yard. Agaves are sharp-leaved plants that need little water so they do very well in arid places and the Sonoran desert is no exception. Once in their lifetime agaves send out a flower stalk which we refer to as a spike. The spike flowers and then produces bulbils (plantlets) or seeds. Once the process is complete, the mother plant dies. 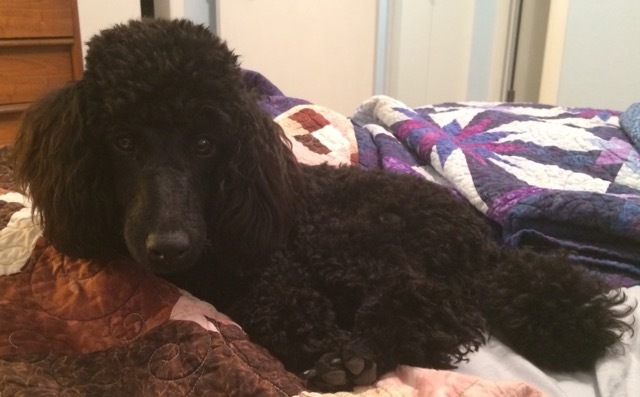 Before the plant dies, however, it generally produces other plants which are called pups. 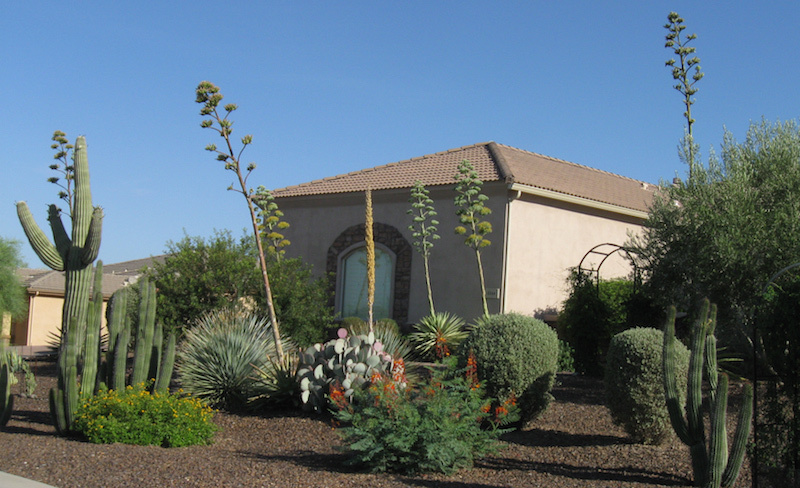 We moved into our home and several agaves were already in place and then we added additional species. Each agave species or type flowers according to their own timetable and if you were planting a bunch of agaves from the same species, you would want to purchase them at different stages of growth so they don’t all spike at once and end up dying at the same time. Yes we have seven spikes all at the same time. As I indicated above, these are not all the same type of agave and it just worked out that they spiked together. We have one additional twist to the story. Among the agaves is a sotol (Dasylirion wheeleri) , or desert spoon (#4). They also send out a spike. One of the main differences is that the sotols don’t die after producing their spike. They continue with their life cycle. You can see that it looks quite different from the others. While we have at least three sotols, only one has sent out a spike this season. Here is a close up of the one section and the sotol is a bit more noticeable (right of center). We found this random occurrence unusual and it makes our landscape look a bit otherworldly with all those spikes in the air. What are your thoughts? I wanted to follow up on a previous post about using Lightroom (LR) with JPG (JPEG) photos. A friend was somewhat interested in learning about LR and she was wondering what effect LR would have on cell phone photographs. Quite frankly, that was a pretty good question since I had never used LR with photos taken on a cell phone. Contemporary cell phones can produce images that are quite good and they do have some large files, but do they allow the kind of manipulation that our previous JPGs enabled? 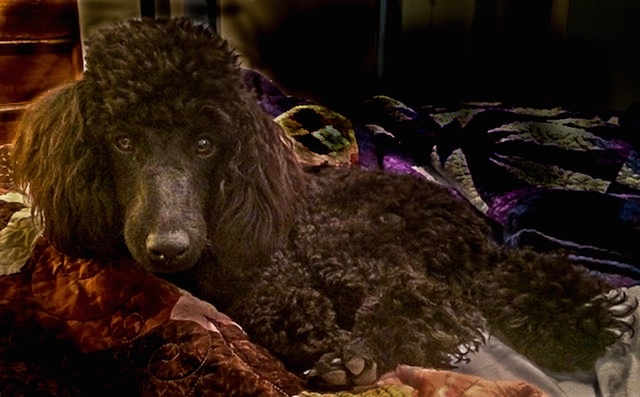 My friend had a recent photo of her standard poodle that she wanted to improve. The original file is below. It is only 189 KB; not much data with which to work. The other requirement was to spend no more than five minutes working on the file. If you read my previous post (Lightroom for JPEG (JPG) Images), you understand that I am not a LR expert and perhaps just a bit more than a novice, but I thought I would give it a try. I am not saying the result was excellent, but I was able to recover some detail and darken the background to allow the dog to become the focal point. I could have used a vignette, but I did not think it would render as well. While it may not be superb, I do think even a reduced size cell phone picture shows the benefits of being corrected in Lightroom. What do you think? Leave a comment below! 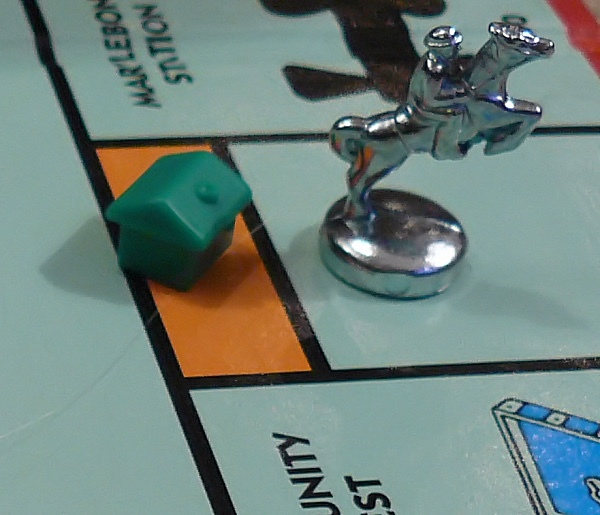 Do you know how many spaces on the Monopoly board are not for sale? C’mon…take a guess! Do you want to take a timed quiz to find out? If so, visit this web page to test your knowledge! Name the Spaces You Can’t Buy in Monopoly via Mental Floss – You will only have two minutes so be quick! 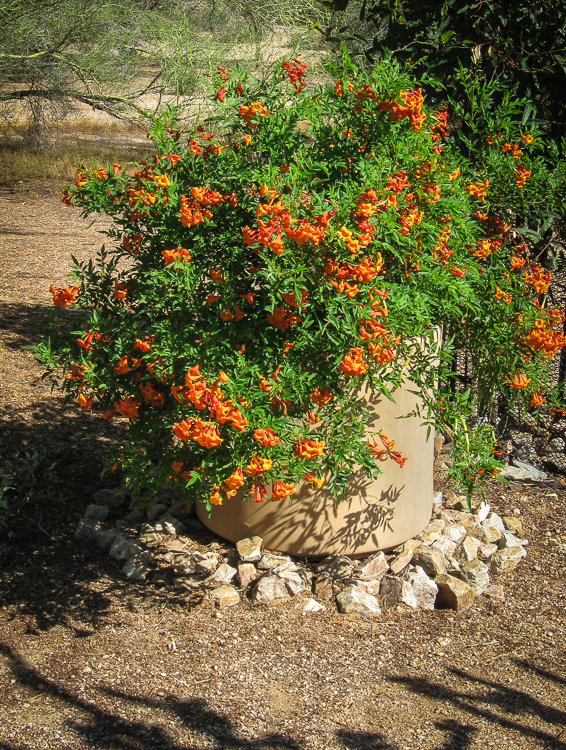 Another interesting and worthwhile plant to have in the desert garden is Orange Jubilee (also called Orange Esperanza or Orange bells) or any of its variants. The plant is trimmed to between three and four feet tall (+/-) because it grows in a large container. If grown in the ground, it will be much larger. It extends to about six feet wide. 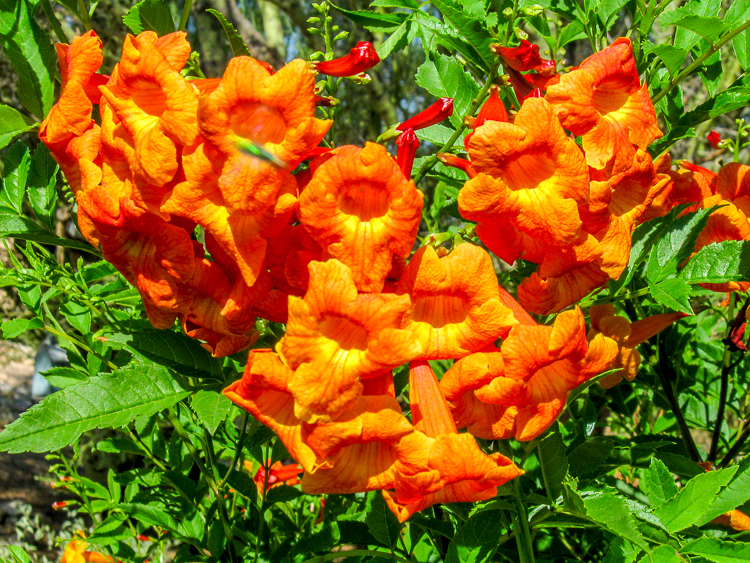 The showy orange flowers bloom in clusters at the end of the branches as you can see in the photographs. When I notice seed pods, I remove them to extend the long blooming period even more. 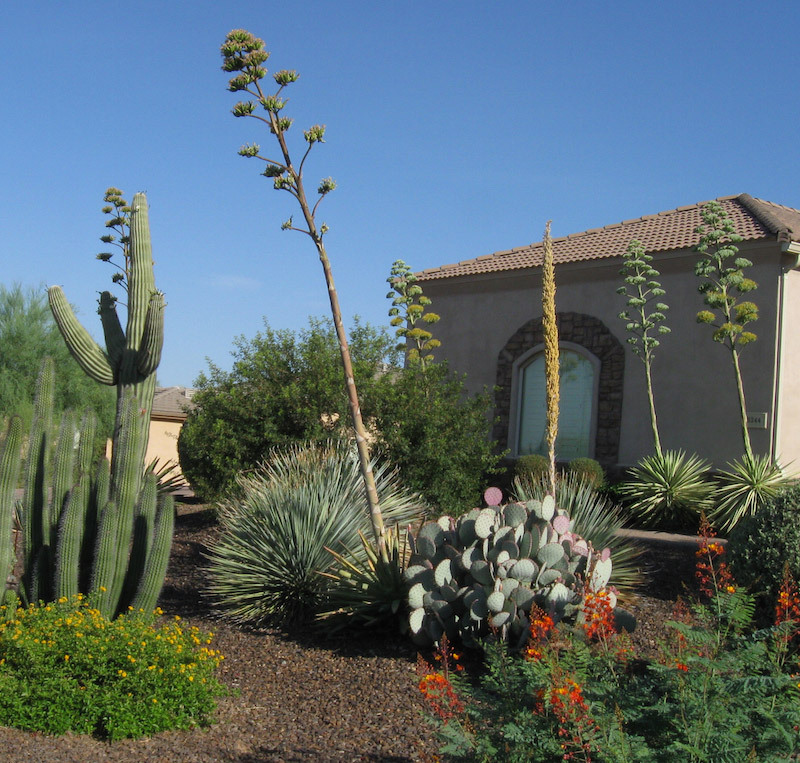 Hardiness range (depending on where it is grown): 0 to 40 F. The key with desert plants is to wait until all danger of frost has ended before pruning any damaged branches as the new growing season begins. Exposure: Almost full sun (8-10 hours per day during the hot desert summer). Our shrub has afternoon shade coming from the west courtesy of a nearby Foothills Palo Verde. In General: The plant is trimmed in stages at the beginning of the growing season. I remove very long and spindly branches and watch for the new growth. Once it starts to get bushy again, I trim more to maintain an even shape. Another tenet of xeriscape gardening is to keep trimming to no more than one third of the total growth. I try to keep it a bit less than that as these plants will be under stress during the upcoming hot weather. 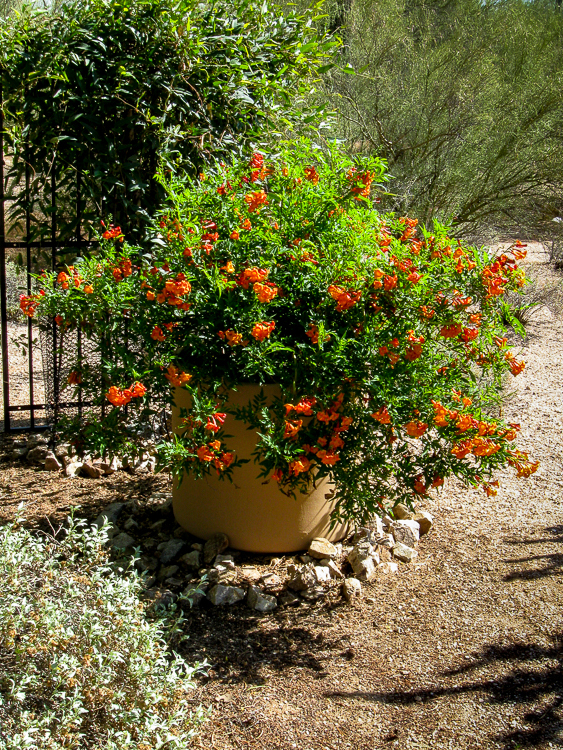 Fertilizer: I use a standard desert tree and shrub fertilizer (16-8-8) along with a tablespoon of a “super bloom” – type to add extra elements. If you like these orange clusters and a nice green, bushy plant give Orange Jubilee a try!